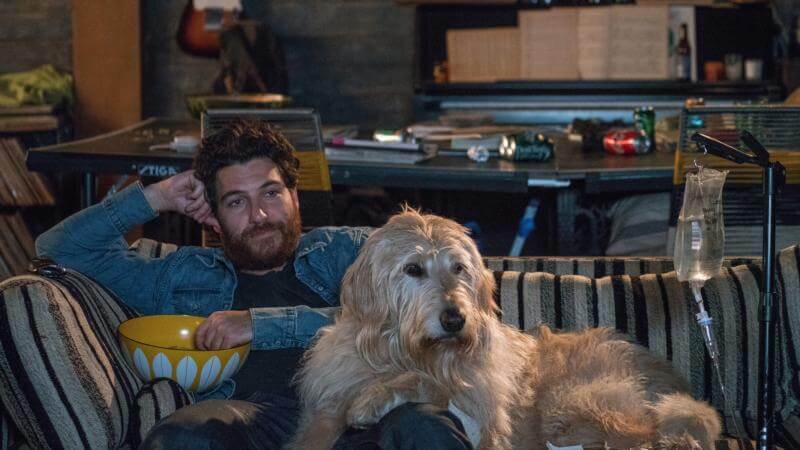 Photo Credit: CNS photo/LD Entertainment - Adam Pally stars with a dog named Charlie in a scene from the movie "Dog Days." The Catholic News Service classification is A-II — adults and adolescents. The Motion Picture Association of America rates this film PG — parental guidance suggested. Some material may not be suitable for children. Written by Elissa Matsueda and Erica Oyama and directed by Ken Marino, the new comedy “Dog Days” (LD Entertainment) is comprised of a number of vignettes, following a variety of Los Angeles residents as they navigate life through a summer of challenges. Helping them in their times of need are their loving canine companions. We first meet Elizabeth (Nina Dobrev), owner of Sam, a cute little terrier who barks happily at the TV when he sees Liz there as the host of “Wake Up, LA!” When she loses her cool during an interview with NFL star Jimmy Johnston (Tone Bell), owner of Brandy, the studio assigns Jimmy as her co-host. She’s not pleased at all. Then there’s Ruth and Greg (Jessica St. Clair and Thomas Lennon), owners of Charlie. Ruth is pregnant with twins and going through all the mood swings involved, even blaming Greg for her condition, not in a nice way. Unfortunately, the interaction between Ruth and Greg, even though meant to be comedic, portrays an attitude toward marriage, pregnancy and children that might turn off some Catholic viewers. They ask Dax (Adam Pally), Ruth’s brother, to watch Charlie after the babies are born. He agrees although he thinks he might not be up to the task. Next in line is Tara (Vanessa Hudgens), a barista who hopes to be able to put her college degree to good use someday. She finds an abandoned dog behind the coffee shop’s dumpster and takes it to the dreamy veterinarian across the street, Dr. Mike (Michael Cassidy). Meanwhile, rescue dog agency owner Garrett (Jon Bass) just wishes Tara would notice him. When pizza delivery boy Tyler (Finn Wolfhard) meets Walter (Ron Cephas Jones), owner of Mabel, he’s not impressed. Walter complains that the pizza should be free since the delivery wasn’t made within the 30-minute guarantee. Tyler leaves muttering, “This is why kids don’t like old people.” Meanwhile, Grace (Eva Longoria) and Kurt (Rob Corddry) worry about making a good impression on their newly adopted daughter, 5-year-old Amelia (Elizabeth Caro). When the characters make connections with each other, the dogs lead the way. Widower Walter collapses while walking Mabel and she runs off. Tyler, witnessing the event, comes to Walter’s aid then promises to help him look for Mabel. Liz and Jimmy discover they take their dogs to the same beach area. Tara begins to see Garrett as more than just a geek when she begins volunteering at the rescue agency. Garrett decides to name the dog Tara found, Gertrude, after American poet and playwright, Gertrude Stein. Some viewers may find the reference to Stein, who wrote about — and lived herself — the homosexual lifestyle, a bit disturbing. The film contains two crass terms and some negative comments about marriage and pregnancy. The Catholic News Service classification is A-II — adults and adolescents. The Motion Picture Association of America rates this film PG — parental guidance suggested. Some material may not be suitable for children.